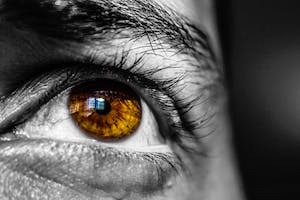 If you have trouble seeing or are legally blind, you may be able to get higher benefits from the Social Security Administration than those with other disabilities. After they determine if you are blind, the SSA will pay you benefits under the Supplemental Security Income or Social Security Disability program. 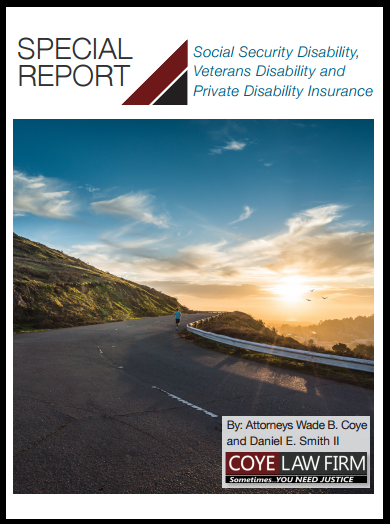 The Coye Law Firm's disability attorneys work for benefits regardless of the disabilities our clients are dealing with. We know that your ability to work can be affected by many things, and we want to help you get compensated for lost wages. Call our offices today after reviewing this article to speak with a member of our staff and begin work on your case. Based on your medical evaluation, your eyesight is categorized as legally blind or severely limited. If your better eye's vision cannot be corrected to better than 20/200, or if your visual field is 20 degrees or less in your better eye, then you are considered legally blind. Limited vision needs to be combined with another health problem and prevent you from working in order to qualify for benefits. Eyesight does not necessarily prevent a person from working. There are many careers and positions that blind or nearly blind people can prosper in. In order to qualify for benefits, your blindness needs to interfere with your ability to work or perform daily functions. Economic requirements are the same as standard applicants for SSD and SSI. People applying for Supplemental Security Income need to be living on limited income and resources to qualify. Social Security Disability benefits are given to those who have enough work history and paid enough payroll taxes to earn work credits. Work credits help to determine if you've paid enough payroll taxes to fund the Social Security disability program. But how do you earn enough work credits if you are blind? Some individuals are able to work despite their blindness and earn work credits toward future benefits. If necessary, a blind applicant may be able to add work credits earned by their parents or spouse to their own total. The medical requirements for SSI and SSD may be the same for blind applicants, but there are different methods for calculating benefits in these claims. disabled people who are not blind can earn up to $1,000 a month and qualify for SSD. Blind claimants, on the other hand, can earn $1,640 and still qualify. These limits on earnings change yearly to keep up with the cost of living. The SSA communicates with disability applicants in many ways. Unfortunately, most of them are text based and require vision. Their offices are sensitive to the needs to blind applicants, so you may request phone calls, compact discs, or Braille booklets to replace the typical written correspondence. If you are looking for information on other programs offered by Social Security written in Braille, call them at 1800-772-1213 to request one be sent to your home. The Coye Law Firm Disability Center has experience winning disability appeals for all types of applicants. If you are blind and have been denied benefits, call our offices immediately. We can ensure that your rights and interests are protected.